The Nintendo Switch had a big blowout last week and many people have taken it various different ways. In terms of the systems lineup some were disappointed and others ecstatic. I’m in the latter camp because the Switch, to me, has more games coming in its first year that I’m excited about than I was over the Wii U’s entire lifespan. 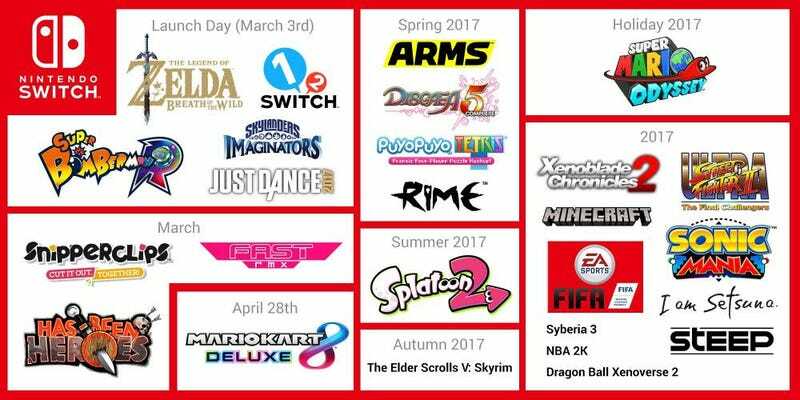 So these are the games I’m looking forward to for the Nintendo Switch. This is the big no-brainer. Just about everyone who has an interest in the Switch is excited for Breath of the Wild even though it’s also coming to the Wii U. It is hands down the most anticipated Switch title with hype levels that are through the roof and the recent trailer only kicked that into high gear. I admit that I love the art style, typically I prefer something more realistic and I feel like that would work with Zelda, but this is still great. It’s beautiful and it has more detail than Skyward Sword did. The team at Nintendo have put everything they have into this game and it really shows. I wasn’t excited for Skyward Sword. I am excited for Breath of the Wild, especially with the more cinematic approach to storytelling that Nintendo appears to be trying. I wanted to get the two obvious games out of the way first. I’ve been a Mario fan ever since I was little with my very first game being Super Mario World on the SNES when I was around 2 years old. And to this day, Super Mario World and Super Mario 64 are my all-time favorite Mario games. So to me, Super Mario Odyssey taking inspiration from Super Mario 64 and Super Mario Sunshine is nothing, but a good thing and that DNA is very apparent in the Odyssey trailer. It’s a shame that it isn’t coming out until the holidays and if the game is as done as people are saying it is, then that makes it all the more disappointing. However, a whole year of polish is nothing but a good thing because the game will be as good as it could be at launch. About two years ago a little indie game called Fast Racing Neo released on the Wii U. Inspired by games like F-Zero and Wipeout it scratched that F-Zero itch that many Nintendo gamers had. It was a great game and one that I frequently play with friends despite the massive FPS drop when playing with 4-players. It’s a blast, it’s fast, it’s everything it needed to be. It’s also very gorgeous. Fast RMX, the sequel to Fast Racing Neo, is releasing exclusively for the Nintendo Switch in March and it looks better visually than Fast Racing Neo and supposedly performs better as well(Though it’ll still suffer when played split-screen.). ARMS feels a lot like a Wii game in its presentation, but I don’t feel like there’s anything wrong with that. Many people fell in love with the Wii because it was unique and tried something completely different(And old grandma’s wanted to play some Wii Bowling.). There was a novelty to motion-controlled sports and ARMS looks like the Switch’s promising new first party IP. The motion controls are reportedly responsive and work very well(Though traditional controls are also supported.) so I’m sold on this game. I think it looks good and may do for fighting games what Splatoon did for shooters. Yeah, this one is a port of a Wii U title, but Nintendo actually has a valid reason for doing ports: To give more people the chance to play games that they might have missed if they didn’t have a Wii U. Mario Kart 8 is in all likelihood the first in a series of ports and it isn’t a bad port. New characters, new items, and an overhauled battle mode make Mario Kart 8 Deluxe worth double-dipping for if you already own it on Wii U. Plus, being able to take it on the go with you is a nice bonus. I’ll admit right off the bat that while I own both Xenoblade Chronicles and Xenoblade Chronicles X, I have not played the former and I’ve barely touched the latter. Not because I have no interest and just own them for shits and giggles, but simply because I’ve had so many other things to do that sinking countless hours into another RPG is intimidating. My backlog is enormous. But I fully intend to play them through from beginning to end and I expect to enjoy them. The three hours of Xenoblade X I played were good though they were story lite which was not what I was looking for. The only reason I spent only three hours playing though is because my Wii U GamePad ran out of juice and I had to put it on the charger. I just never picked the game back up because I got busy and then forgot to go back to it. I only recently acquired the original Xenoblade and to my knowledge Xenoblade 2 will be more like the original games with a heavier focus on story and characters which is a big plus in my book and why I’m excited for Xenoblade 2. Plus, just look at the scale of that game. It’s the sort of game that you’d swear shouldn’t be possible on the Switch, but it is and is a testament to the power of the system. I will admit that I haven’t dug into the Shin Megami Tensei series, at least, if you don’t include Persona. I own Shin Megami Tensei IV for the 3DS and while I was having fun with it, I got roadblocked somewhere and never picked it back up. So like Xenoblade, it’s a series that I genuinely like, but got stuck somewhere and ultimately forgot to pick it back up and try again. The announcement that the fifth numbered entry in the series has just begun development and is coming to the Nintendo Switch is great news and the fact that everything is 3D now excites me even more. The question remains, just how far will they go? I’m a sucker for Warriors games because I just love mowing down large groups of nameless mooks. The Legend of Zelda felt like a bit of an odd choice, but it ended up working and now Nintendo has given Omega Force the go ahead to do a Fire Emblem game in the same vein and I feel like that would be a natural fit for it. As of this writing there will be a Nintendo Direct in about an hour and a half that will give out more information on Fire Emblem Warriors so we’ll know soon what the deal is with it. Weird names aside, this game actually looks kind of interesting with its hybrid artstyle consisting of 2D pixelated sprites and 3D backgrounds. It’s not the first time I’ve seen something like it, but this just somehow looks... different. It also looks kind of fun and classic so I’m more than willing to give it a shot. Xenoverse 2 has already released on PS4, Xbox One, and PC. I want it, but I might just get it for the Nintendo Switch. Having a newer fighting game that I can take with me on the go is great. Ultra Street Fighter 2 doesn’t interest me, this does. And judging by the sizzle reel they showed at the Switch event, assuming it was Switch footage, it doesn’t look any different. I didn’t play the first Splatoon game, and Splatoon 2 looks more like a Splatoon 1.5, so really I feel like I’ll be killing two birds with one stone. I’ll buy Splatoon 2 and it’ll be like I never picked up the first game. I have Fire Emblem Fates - Birthright, but I have not beaten it. A Switch port of the game was supposedly outed via some code-spelunking regarding the Nintendo Direct today, but it could have just been a lazy copy-pasta job. If it is true though, and we’ll know soon, you can be sure I’ll make an article about it if it is(Provided it’s more than just a straight port that is.). Pokemon is a big IP for Nintendo, it’s a system seller, and the rumor is that a combined version of Sun and Moon, codenamed Stars right now, which uses higher quality assets is due for release on the Switch sometime this year between summer and the holidays. I skipped Sun and Moon because I wanted to finish X and play through Alpha Sapphire first, and by the time this comes out, if it’s real, I may as well just pick this up in place of Moon. Of course I’ll take a brand new Pokemon RPG for Switch as well, but this is all that’s rumored right now and would basically be a sign that Pokemon is jumping systems again. Metroid is coming you can be sure of that, and while Reggie stopped short of confirming its existence, he hinted that it will be revealed within the year. So for now, it’s a rumored title, and teases on Nintendo’s side hint at Metroid Prime 4. I will buy it day one and pre-order it the moment they make it official. One of the other rumored ports, more Smash Bros. is always welcome. It might be a while until we get a brand new Smash game, so having this ported over to the Switch both for returning players and new player alike, is a great thing. Update #1: I’m updating because I just put this article out so people are still reading it. Fire Emblem Fates - Revelations for Switch is not a thing, however Fire Emblem Warriors will be coming out this fall for Switch and New 3DS, and a full-fledged Fire Emblem installment will be coming exclusively to Nintendo Switch in 2018. Nintendo is already priming their 2018 first party lineup. I love it.